Graceville Library offers this great program. What is our goal? Our goal is to provide a simple, innovative yet fun approach to establishing strong early literacy skills. We help young children gain the confidence necessary to become strong readers. Please stop in and talk to one of the staff about enrolling your child in this free program today. The concept is simple, the rewards are priceless. Read a book (any book) to your newborn, infant, and/or toddler. 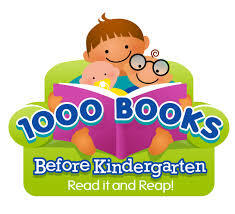 The goal is to have read 1000 books (yes, you can repeat books) before your precious one starts kindergarten. Does it sound hard? Not really if you think about it. If you read just 1 book a night, you will have read about 365 books in a year. that is 730 books in two years and 1095 books in three years. If you consider that most children start kindergarten at around 5 years of age, you have more time than you think, so get started! Go to your library to get your bag and folder with all the information that you need to help get you started. You will be given a log sheet to write all the books down that you read to your child. Return the completed log sheet to the library. There are incentives for the child for every 100 books read. Once they reach 1000 books, they will receive a big prize at the end and a medal of completion.